Sinking Steps…Rising Eyes was a screamo band from South Dakota. They had 2 bass players, guitar, 2 vocalists, drums, and keyboards in September 2001. In 2002 they wrote five songs, recorded them and then released them all in a self-titled EP. Then they did a summer East Coast tour as a six piece to promote this EP. In winter they wrote another record. In March 2003 they recorded the Majestic Blue record. In Summer they toured Iowa, Cornerstone and Indianapolis. 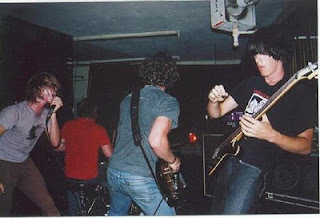 In October 2003 vocalist Brandon DeJong went away- They recorded some unreleased stuff. Eli and Josh formed the band Roman Ships.